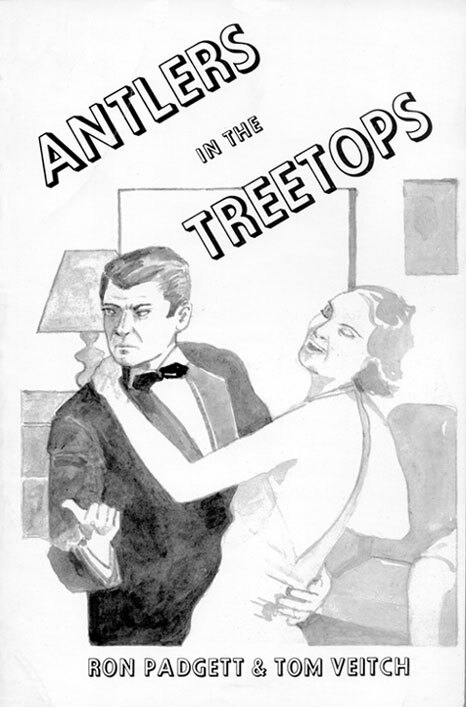 Tom Veitch and I wrote Antlers in the Treetops in the late 1960s. We had already written short stories and a science fiction novel together, taking turns at the same typewriter, but Antlers was something of a departure. As far back as 1963 Tom and I had been experimenting with artistic appropriation (as it’s now called), inspired by our discovery of Duchamps’ found objects, Schwitters’ collages, Tzara’s cut-ups of newspaper articles, Burroughs’ more developed cut-ups, and the cento. We did not think of our plagiarism as nefarious, though it did seem a bit subversive; in one case I took a poem by Stephen Crane and changed a single word in it. In writing Antlers we followed a procedure: each of us collected paragraphs that we happened to find in our ordinary reading, snippets from fiction, nonfiction, journalism, letters, whatever. Choosing whatever struck our fancies, we made no distinctions between high and low literature. After one of us had “enough” of these, he mailed them to the other, whose job it was to select and arrange them in a sequence that seemed to make sense and to lightly revise them for continuity. Then this second person would mail that section to the first person, along with a batch of new found material for the first peson to work with to the continue what I will call the narrative (a forward motion not unlike that of de Chirico’s Hebdomeros). We went back and forth like this until we decided that the first draft was finished, then we both lightly revised the entire text. Then all we needed was a title—a found title, moreover. I think it was I who, remembering the childish jokes based on imaginary book titles (The Little Golden Stream by I. P. Freely, Under the Grandstand by Seymour Butts, the Tiger’s Revenge by Claude Balls, etc. ), chose one of the lesser-known and certainly less clever ones, Antlers in the Treetops (by Who Goosed the Moose). Not long afterward, Victor Coleman at Coach House Press generously offered to publish the novel. The first edition (1970) bore a black-and-white cover drawing by George Schneeman, taken from an illustration for a pulp fiction crime story. When this printing of 1,000 copies sold out, someone else at Coach House decided to reprint the book (with a different cover), but neglected to alert Tom and me, so the typographical errors of the first printing were perpetuated in the second. The new editor also failed to change the cover design credit on the copyright page, wrongly attributing the new art to Schneeman. to know the three different noises made by nightjars. morrow is the millennium and one-third of the world will perish.